1991-2001: The Resurgence Years - LFChistory - Stats galore for Liverpool FC! In 1990, 5 years after Heysel, English clubs were re-admitted to the European fold. Liverpool, however, had to wait another year before their own exile was ended. The first European tie at Anfield for over six years took place on a warm evening in the middle of September 1991 in front of a relatively small crowd. The visitors were Kuusysi Lahti from Finland. They were perhaps ideal opponents against which to compete after such a long absence. The European ban had prevented seasoned international players from playing on the European club stage and the rules in place at the time meant that only four foreigners were allowed to play in each team. UEFA seemed to change their rules frequently but this was a big disadvantage to many English clubs in particular, especially as all their British players who were not English were also classed as 'foreigners'! Exceptions were made depending on length of service with a club, etc. but club officials had to be very knowledgeable to make sure the rules were not broken by fielding too many foreign players at the same time. Lahti were thrashed 6-1 but the final score does not do justice to the way the game unfolded. Liverpool took an early two-goal lead but the Finns pulled a goal back before half-time with a shot which deflected in off Nicky Tanner. Midway through the second half, the Reds were still clinging on to that slender advantage and the crowd and players were getting increasingly frustrated. But then Dean Saunders scored a quick hat-trick and the scoring was finished off by Ray Houghton. The away leg was one of the poorest performances by a Liverpool side in Europe. Even with a relatively young side, they should have dome better than lose by a single goal to a team which frankly was not in the same class. But it did prove perhaps how much English clubs had fallen behind during the years when the ban was in force, although it is also true that many clubs from smaller nations were increasingly well organised and difficult to beat. The second round cup took Liverpool to France to play Auxerre. Again a very young and inexperienced team was selected to fit in with UEFA's regulations but conceding a goal in each half meant that there was a real uphill battle to be faced when the teams met again on Merseyside. It turned out to be one of the great nights in Liverpool's history. Maybe not on a par with Inter Milan (1965) or St. Etienne (1977) because those were later rounds played in front of a full-house but considering Liverpool's long absence from European competition and the young side they were forced to play, it was certainly just as praiseworthy. The stadium was not even half full and yet those present made as much noise as if the game had been played in front of a capacity crowd. 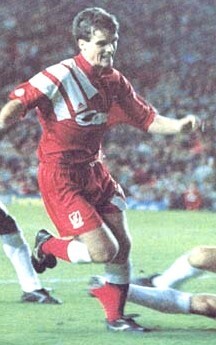 Jan Molby's early penalty was a big bonus and before half-time Mike Marsh had headed in the goal which levelled the aggregate score at two apiece. Bruce Grobbelaar had made a crucial save at 1-0 but had little to do in the second period as Liverpool's players poured forward in search of the winning goal but still aware that if the French scored it would probably be decisive. As the minutes ticked away, Molby's pass sent Mark Walters through on his own and the crowd held its breath before the shot across the 'keeper finally nestled in the corner of the net. It had been a remarkable comeback. On a freezing day in Austria, Dean Saunders scored the goals which defeated Swarovski Tirol 2-0 and he went one better when the teams met again at Anfield, Barry Venison's long-range shot completing the scoring in a convincing 4-0 victory. There was a long wait for the quarter-final the following Spring and when the draw was made Liverpool were paired with Italian opposition in the form of Genoa. Security was not surprisingly tight for Liverpool's first match against an Italian club since the ill-fated European cup final with Juventus in Brussels but the game passed off relatively incident-free with the most significant statistic being Genoa's two goals. There were hopes that, as against Auxerre, this deficit could be overcome and maybe because a lot of younger supporters had not seen many European ties and so they had almost become a novelty in comparison to the domestic matches, Anfield was sold-out for the return game. The first goal was always going to be crucial but it was the Italians who grabbed it through Aguilera. Ian Rush equalised but Aguilera scored again to knock Liverpool out. There were no complaints. Reaching the quarter-final was probably about as far as the club could have expected to go but it had at least given a taste of what things used to be like before the ban. Beating Sunderland in the 1992 F.A. cup final put Liverpool into the Cup winners' cup and they comfortably beat the Cypriots from Apollon Limassol 8-2 on aggregate, Ian Rush scoring five of those goals. A tricky trip to Moscow followed and midway through the 2nd half everything looked good for a great result when Steve McManaman scored from a narrow angle to make the score 2-2. But then Bruce Grobbelaar made the headlines for all the wrong reasons. His error lead to Spartak taking the lead again and then he was sent off after conceding a penalty towards the end. 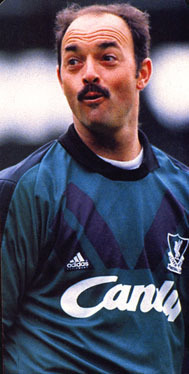 David Burrows went in goal to face the spot-kick but was easily beaten and once again Liverpool had to overcome a two-goal deficit if they were to progress. The away goals scored in Russia meant that a 2-0 win would be enough but as Liverpool took more risks after half-time with the score on the night still goal-less they left gaps at the back, which were exploited by first Radchenko and later Piatnitski. Although Liverpool would have qualified in one competition or another for every season between 1985 and 1991 had the ban not been in force, they were now faced with the prospect of only having domestic games to keep them occupied for the next two years. But in 1992-93 as Graeme Souness' turbulent spell as manager continued, qualifying for Europe was the last thing on the players' minds as they found themselves at the wrong end of the table. As late as March they were hovering in a dangerous position only just clear of the relegation zone and although they put a good run of results together in the last few weeks of the season, a place in the UEFA cup was beyond them. After Roy Evans had replaced Souness as manager, he guided the club to its 5th success in the League cup during his first full season in charge and that victory guaranteed the club a place in the following season's UEFA cup competition. Liverpool faced a long and arduous journey to Vladikavkaz to face Spartak and achieved a marvellous victory despite falling behind. Steve McManaman curled in a terrific equaliser from a narrow angle before half-time and after the interval Jamie Redknapp's thunderbolt gave the team a second priceless away goal. At Anfield Liverpool seemed content to soak up the pressure without concentrating too much on attack, believing ­rightly as it turned out ­that the hard work had been done in the away leg. But it is a dangerous game to play because if you just sit back and let the opposition have more of the ball and then concede a goal, it means the tie is very much back in the balance. They weren't ideal tactics but they were tactics the supporters would have to get used to in future years after a good result in the away leg. Fortunately on this occasion Spartak were unable to break through and Liverpool went through to face the Danes from Brondby. Again, they seemed to have done the hardest bit by drawing away in Copenhagen but a 0-0 score meant they had to be even more careful at home than they had been in the first round. It was a tight, tactical game but as time wore on without either side making the breakthrough, the atmosphere became very tense. When a goal did finally come, it was from the visitors, with Norwegian Dan Eggen heading in from a corner. Although the crowd lifted the players as much as they could after this setback, the team never looked likely to score the two goals they now needed in what little time remained. It had been yet another disappointing early exit. Liverpool knew even before their F.A. cup final date with Manchester United in 1996 that they would be competing in the Cup winners' cup again, no matter what happened at Wembley. But if losing to one of their most bitter rivals was hard to take, the manner of that defeat left an equally sour taste in the mouth. But that "White Suit" final was just a bad memory by the time the next season started and as the Champions' League was also taking the League runners-up from the major European countries, it left Liverpool among the favourites for a competition which was soon to be scrapped anyway. Liverpool faced yet more Scandinavian opponents in My-Pa from Finland but Stig Inge Bjornebye's away goal took a lot of the tension out of the home leg, which was subsequently won comfortably enough by three goals to one. Then it was on to Switzerland to face Sion and another away victory, this time secured by Fowler & Barnes after Dominic Matteo's early error had given Bonvin an opportunity to open the scoring. The return at Anfield was a remarkable match. By half-time the visitors were leading with the same score by which Liverpool had triumphed in the first game, 2-1. Bjornebye equalised direct from a free-kick but amazingly the Swiss scored again and this time they were ahead on the away-goals rule. Fortunately, John Barnes equalised almost at once before late strikes from Fowler and Berger gave the Reds a comfortable 6-3 victory on the night but nobody would have predicted that score when the Swiss had scored their 3rd goal to shock the home fans just twenty or so minutes earlier.